Hi guys, today we are going to talk about that the MPL League the most popular game of this month. As most of the YouTubers are reviewing it, we decided to lets justified MPL league Fake or Real. And I’m sure that you cannot find any post like this in any Blog on Google. What types of games are available here? How we Earn Money from MPL? 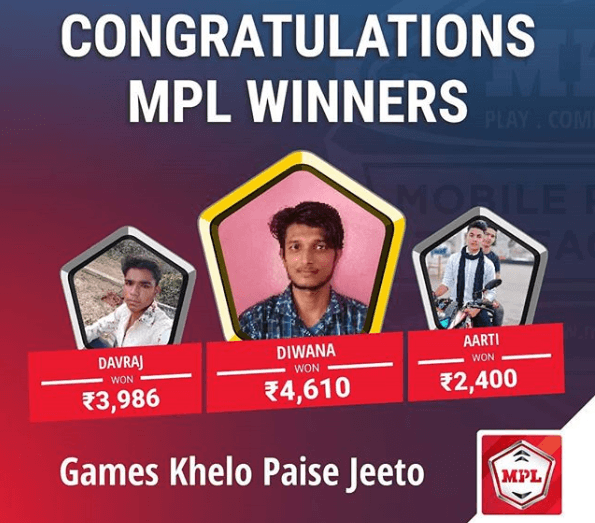 MPL Means Mobile Premier League. It is a game which rewarded you with real money by playing some games like balloon buster, Temple Run and Fruit Ninja, Space breaker, Playout, and many more games are coming very soon. Here you get many games to play and earn. We personally paly all of this games which we going to give review below, their review is our own. Hope this review will help you with sufficient information. If still, you have any questions then you may ask us in the comment section. Balloon Buster= Shoot the balloons and burst them then get points and earn money. Temple Run = The real name of the game in this game is Runner No.1 is just similar to Temple Run, Run and Run the black bear is behind you and you have to jump, Slide, Collect Powers and Defend from Obstacles. Fruit ninja= Real name Fruit chop, In which you have to cut the fruits and as many fruits that many points and if you cut in a row you will get more points.and as many points as any money. Space breaker= The game in which there are rectangular boxes and you have to break or Blast them. Play out= Playout is a cricket game, But having not much good graphics. After playing some time I was having headache such the worst game in the whole world. Many more= The games are designing as they need more games that more peoples will come to there site. Play as many times as you want in a single tournament. This game is available on Play store and apple store and only on Android and IOS but if you want this or any game or app on PC or Mobile just comment me below I will tell the best method. It Is simple as when you were playing the games as we are playing games and if i make a score of 2,000 and then I lose and after then they will see our ranking and by that when a season ends they will give us money and now you will think it is so easy and we will earn thousands of money No you can’t see this table before you download it. And now you will think that what is bad in it we can play games and earn money slowly-Slowly but bro at start they give us only 30 Points which we can use only in 2 games as each game takes 15 points and it last for 20 minutes and when you will be left out with 0 points then you will have only two ways First to buy points at 50 points at Rs.110 or 2nd Step is to give your all personal information to them and they will give you only 30 points. So, in this post, we know about MPL League & It is fake or real. After Reading this all, I’m sure that you understand MPL is Real or fake. Now, it depends upon you what you think about it. If you think this article helps you then don’t forget to share with your friends who want to know about the same. Have you earned any money from it? If “Yes” then don’t forget to give your opinion/review about this MPL league. Earn money Games mobile premier league MPL MPL League mpl real or fake?